Discussion in 'Cross Country, All Mountain & Trail Riding' started by ZenkiGarage, Mar 19, 2008. So im now looking at carbon forks also(cant have to many fork options ) and im just curious about their strength. I know it will have a little more give than my cromo rigid fork but is it going to be weaker than the cromo fork? 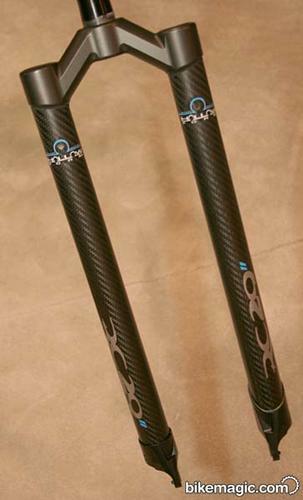 Have a look at the On One Superlight carbon fork - go to pricepoint to find em. That'll be plenty strong and it'll perform great. I have a Pace RC29 on my single speed for the last 2 years and I think it is excellent. Very light and strong. I've run the Pace 29er carbon for 2 solid seasons in Colorado and love it. I got to honest. I thought this thing was going to break by now. I weigh 2 bills plus I ride with 10 pounds of gear at least on long days and ride the most tech terrain I can find, not to mention the crashes I've had. It is tight spacing for the rotor bolts on Hope brakes and the lawyer tabs are a little much sometimes. Easy stuff to overlook when performance is the important factor here. I have not ridden any other rigid forks so I can only say this one is good. You also can not go wrong with steel. about how much forward/backward flex can you get at the axle by rocking the bike hard on a hard floor with the front brakes on?